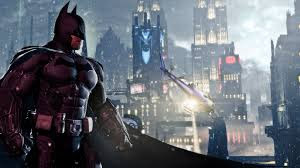 The early days of the Dark Knight are explored in Batman: Arkham Origins for Xbox 360, PlayStation 3, PC and Wii U.
Batman: Arkham Origins tells the tale of a young Batman facing a deadly challenge early in his super-hero career. Set at Christmas, the dastardly Black Mask has hired eight assassins to kill our hero, and you must take them down before they take you out. Batman: Arkham Origins adds new weapons like the Remote Claw to Batman's arsenal, and boasts the largest Gotham City setting in the series to date  fortunately, you now have the Batwing to fly around the city. And Multiplayer mode comes to the series for the first time, letting you play as villains trying to defeat Batman and Robin. On top of this, Batman: Arkham Origins Blackgate comes to PlayStation Vita and Nintendo 3DS, offering a further chance to explore Batman's past in a 2.5-D platform adventure for handhelds. Batman begins again - order Batman: Arkham Origins or Batman: Arkham Origins Blackgate today!